On December 16, the President signed an omnibus appropriations bill that includes a significant funding increase for the Pipeline and Hazardous Materials Safety Administration’s (PHMSA) pipeline safety oversight programs. The enacted Fiscal Year (FY) 2015 budget provides $146 million for PHMSA’s pipeline safety program. This amount is more than the $118 million in the FY 2014 budget, but less than the Administration’s $159 million budget request. Given the priorities outlined in the Administration’s FY 2015 request, it appears that PHMSA will apply the increased funds to hire additional pipeline inspection and enforcement staff, as well as staff involved in pipeline data and analytics. The table below provides information on the status of PHMSA’s rulemaking initiatives as reported by the Department of Transportation in its December Significant Rulemaking Report and by the Office of Management and Budget’s Office of Information and Regulatory Affairs (OIRA) in the Fall 2014 Unified Regulatory Agenda. Revised dates appear in bold. All of the estimated publication dates have been pushed back. BOEM increases offshore oil spill liability limits. On December 12, the Bureau of Ocean Energy Management (BOEM) issued a Final Rule increasing the limit of liability for damages caused by responsible parties related to oil spills from offshore facilities, other than deepwater ports, under the Oil Spill Pollution Act of 1990. The liability limit will increase from $75 million to $133.65 million per incident to account for the increase in the Consumer Price Index (CPI). The rule also establishes procedures that BOEM will use to make future CPI adjustments to the limit of liability. The new limits become effective on January 12, 2015. FERC extends deadlines for commenting on proposed Policy Statement on cost recovery for modernizing interstate natural gas pipelines. On December 10, the Federal Energy Regulatory Commission (FERC) extended the deadline for submitting comments on its proposed Policy Statement that would permit interstate natural gas pipelines to establish a tracker or surcharge mechanism to recover facility upgrade costs related to anticipated pipeline safety, reliability, and environmental regulations, if certain standards are met. FERC extended the deadline in response to a joint motion filed by a number of gas industry trade associations. Initial comments now are due January 26, 2015; reply comments are due February 26, 2015. Proposed legislation addresses pipeline safety. On December 8, Canada’s Minister of Natural Resources introduced legislation in the House of Commons containing a number of provisions addressing, among other things, liability limits associated with releases of oil or gas and operators’ responsibility for abandoned pipelines. SB18 (Hill): This bill would authorize the California Public Utilities Commission (CPUC) to require that the $1.4 billion fine proposed by CPUC administrative law judges against PG&E for violations relating to the 2010 San Bruno accident be held in a separate account and not deposited into the state’s General Fund. Most of the funds would be used to offset investments in pipeline replacements in the company’s service territory that otherwise would be recovered from rate payers. A portion of the funds also would be allocated for an independent monitor to oversee the company’s pipeline operations and to provide seed money for a pipeline safety trust. The bill was referred to the Committee on Rules. SR No.91 (Codey, Thompson & Greenstein): This Senate Resolution urges natural gas pipeline operators to adopt infrastructure, technology and management tools to prevent methane leaks in order to reduce greenhouse gas emissions, improve the efficient transmission and distribution of natural gas, and reduce the risk of methane gas-related emergencies. *New Mexico Public Regulation Commission adopts new rules on excavation and One-Call Requirements. On November 18 , the New Mexico Public Regulation Commission issued a final order amending its rules applicable to excavation damage prevention and One-Call programs. The new regulations require establishment of a “positive response registry system,” and require that underground facility operators’ (UFO) respond to excavation locate requests, even if the UFO determines it has no facilities within the proposed excavation limits. Failure to provide positive responses, pre-mark the intended site, or report damage is a “willful” violation. The final rule is effective immediately. *HB 33 (McCamley): This bill proposes to increase the civil penalties for pipeline safety violations to match limits in the federal Pipeline Safety Act. The bill was introduced on December 15, 2014. *On November 10, the North Dakota Public Service Commission (PSC) issued a notice that it is proposing to amend its pipeline safety regulations to include PHMSA’s regulatory requirements adopted through November 6, 2014. 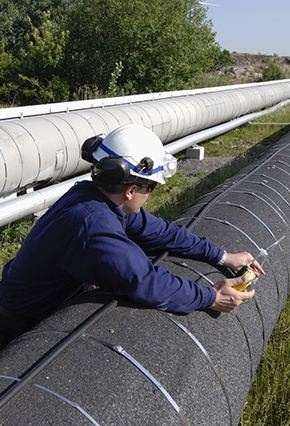 The PSC also is proposing PHMSA’s Part 195 regulations applicable to hazardous liquid pipelines. The PSC convened a public hearing on the proposed amendments on December 15, 2014. Comments are due December 26. *SB No. 378 (Coley): The Ohio General Assembly has passed legislation that, among other things, (1) provides the Ohio Public Utilities Commission (PUC) with authority to enforce the state’s one-call utility protection requirements; (2) sets forth complaint and enforcement procedures for alleged non-compliance with one-call requirements; and (3) creates an Underground Technical Committee to coordinate with the PUC in administering one-call requirements, receive and review PUC reports on complaints of alleged non-compliance, and recommend remedial action. The legislation is pending the governor’s signature. The Railroad Commission of Texas is conducting a survey of pipeline operators of Class 1 and rural gathering pipelines to better understand the risk the lines pose to the public. The survey is part of the process of implementing House Bill 2982, which delegated authority to the Commission to regulate transportation and gathering facilities for gas in Class 1 locations and hazardous liquids and carbon dioxide in rural locations. Responses are due January 30, 2015. The survey is available here. *The Wisconsin Public Service Commission has issued an order amending its pipeline safety regulations to include federal safety standards adopted since January 2013.